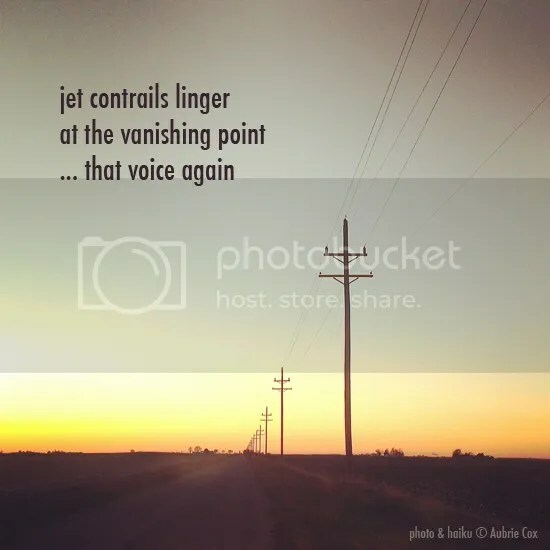 jet contrails – Yay Words! Celebrate the spoken word, the written word, the thought word, the word that exists and has yet to exist. I love this Aubrie. Have you ever seen the movie “Vanishing Point”? It’s from the early 1970s. If not I recommend that you do. It sounds familiar, but I don’t think I’ve seen it. I’ll have to look it up! Dear Aubrie, Beautiful – just beautiful. Now that the leaves have mostly fallen here, the power lines are especially seen, along the roads. Winter sky.